A Bulk Bin is the most cost effective and efficient way of removing large amounts of materials (for landfill or recycling) from your site. With over 50 bulk bins of different sizes (with or without lids) our Hooklift Trucks and staff expertise in this area is ready to find a solution for you. Suitable for both recyclable and non-recyclable waste. Ideal for generators of large volumes of solid waste not suitable for compaction. Highly engineered and certified hook lift bins (12m3 to 31m3). Capacity for large amounts of waste and recycling. Allows safe, easy depositing of waste through walk in doors and large open tops. Reduces traffic movement and number of bins required onsite. Mobile Garbage Bins (Wheelie Bins) – 120litre and 240litre size bins. Each recycling bin is colour coded so there’s no confusion or contamination. Looking for a casual hire bin for home or office? We can deliver a 1.5m3 or 3m3 size steel bin right onto your property with our forklift. Our fixed rate fee includes delivery of bin to your property then we return 5 days later and take it away. No fuss and no hassle – how easy is that! Payment for bin is required prior to, or upon delivery. 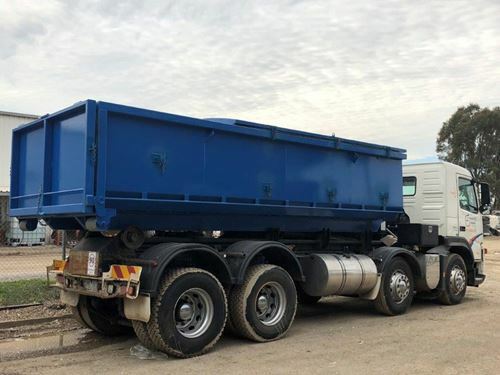 Additional bins and extended hire is available (fees apply). Credit card facilities are available for pre-payment. The following items cannot be placed in our bins as they are not allowed to be taken to landfill: No Asbestos, Oils, Liquid Waste, Paint, Chemical, Car Batteries, Concrete, Bricks, Tiles, Soil, Bobcat Rubble, Tyres, Mattresses, Couches, Whitegoods, E-Waste (Computers, TV), Hazardous Materials. We are happy to discuss alternate disposal methods for these items with you. 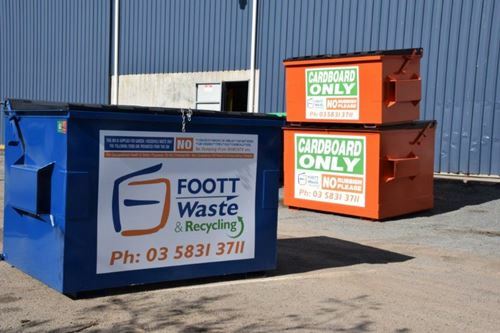 Foott Waste Solutions has a proven track record and the ability to deliver sustainable recycling and waste management strategies for both small and large scale Events. 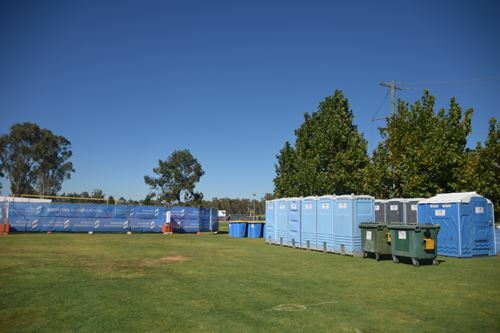 Our experienced staff love to work with event organizers and can supply bins of all types and sizes, single unit toilets, All-Abilities Toilets, cleaners and associated equipment. Delivering toilets and bins together will certainly reduce delivery charges. Following each event, we conduct an inhouse review of all aspects of delivery, equipment supply, usage and placement. Annual events can be finely tuned to ensure the best service provision and value for money. As event committees often change we find the review is helpful for new members to understand how we have previously helped make their Event a success. We have worked with many Event Planners including Greater Shepparton City Council Events Team, Wangaratta Jazz Festival, Great Victorian Bike Ride, Cycling Victoria, GV Party Hire, Winton Raceway, Echuca Racing Club, Benalla Race Club, Alexandra Rodeo and Shepparton Tennis Club.